Gold is trading at Rs 29,150 per ten gram at bullion market on fresh round of buying by local jewellers. Globally, gold fell 0.33 per cent to USD 1,221 an ounce and silver by 1.19 per cent to USD 15.83 an ounce in Singapore. 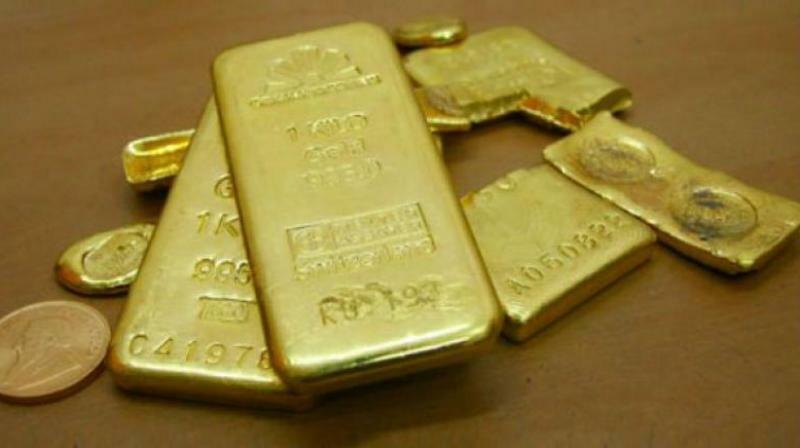 New Delhi: After a four-day falling streak, gold prices surged by Rs 220 to Rs 29,150 per ten gram at the bullion market today on fresh round of buying by local jewellers even as the metal weakened overseas. Silver, however, remained under selling pressure and lost Rs 300 at Rs 38,200 per kg. Traders attributed the recovery in gold prices to increased buying by local jewellers at domestic spot markets at existing levels, but a weak trend overseas limited the rise. Globally, gold fell 0.33 per cent to USD 1,221 an ounce and silver by 1.19 per cent to USD 15.83 an ounce in Singapore. In the national capital, gold of 99.9 per cent and 99.5 per cent purity rebounded by Rs 220 each to Rs 29,150 and Rs 29,000 per ten gram, respectively. It had lost Rs 480 in the last four days. Sovereign, however, remained flat at Rs 24,400 per piece of eight gram. On the other hand, silver ready continued to slide and fell by Rs 300 to Rs 38,200 per kg and weekly-based delivery by Rs 335 to Rs 37,150 per kg. Silver coins, however, remained unaltered at Rs 72,000 for buying and Rs 73,000 for selling of 100 pieces.